Honestly, from the reviews I've read of this book, I was expecting a lot worse. I actually liked the beginning of the book before Bethany was kidnapped and went to Hell. The beginning was very light and fluffy, and sure, she over-romanticized Xavier, but there's nothing wrong with that in my opinion. I liked that Bethany and Xavier had a happy, healthy relationship. However, after Jake kidnapped Bethany and took her to Hell, I wasn't as interested in what happened. The overly sweet writing style didn't work in that setting for me. You could tell the book was written by someone very young, it just felt a bit limited in it's overall view of the world. There wasn't a lot of structure to the world she built or to the rules of that world. There were lots of holes in the plot and setting. I didn't really enjoy the constant bickering between Xavier and Bethany's best friend, Molly, because it seemed too close to flirting. There was definitely one of those "I hate you, I love you" vibes going on, even though it was never addressed. 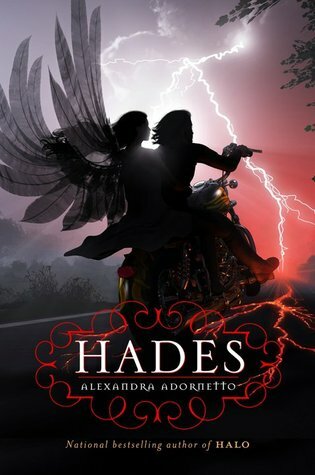 Bottom Line: I really didn't hate the book but I think with the author's style, she might have been better suited to write a gooey, fluffy, teen romantic comedy instead of a paranormal set in hades. I think Adornetto's obvious age influence in her writing is one reason I didn't really enjoy Halo. I will probably pick this up, but only because I hate to leave things unfinished. Great review! It really seems like the eye catching cover would be about the only thing I would like with this one. Thanks for the honest review. Meh, I kind of wanted to read the first book of this series - that gorgeous cover!! - but then I saw how big it is! and hear things like what you said- the overly sweet style and all that -and was put off. It doesn't seem like Iw ould want to pick up this one either :( which is sad, because those covers are so pretty. Great review! It's too bad you didn't like the second part as much but thanks for your honesty. I have read so many mixed reviews about these books. I doubt I will read them one day! thanks for sharing!